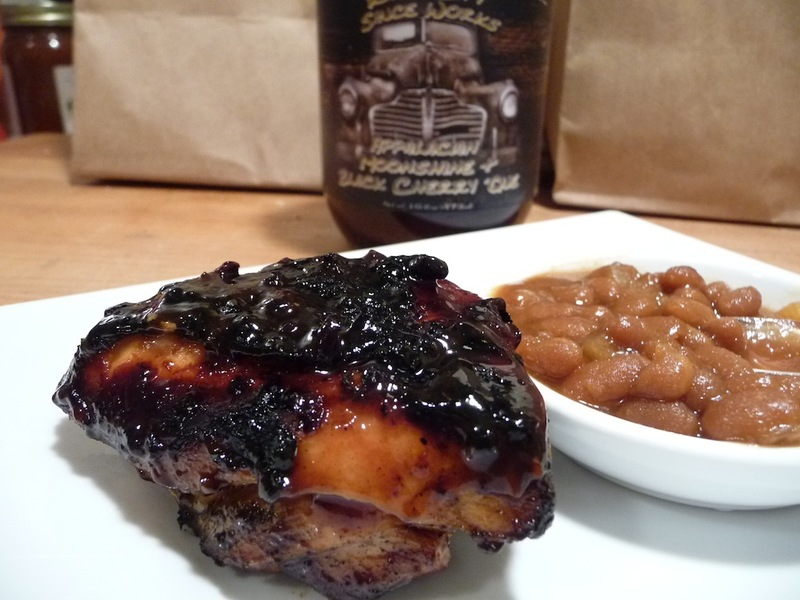 Fresh sweet and tart black cherries blended beautifully with smoked tomatoes, caramelized onions, toasted black peppercorns, brown sugar and just a hint of barrel aged vinegar, this sweet and sassy bbq sauce goes on everything from chargrilled salmon, shrimp, pork or chicken. Chad Lowcock of Race City Sauce Works makes some of the most inventive and delicious pepper sauces, mustards, and condiments on the market today. 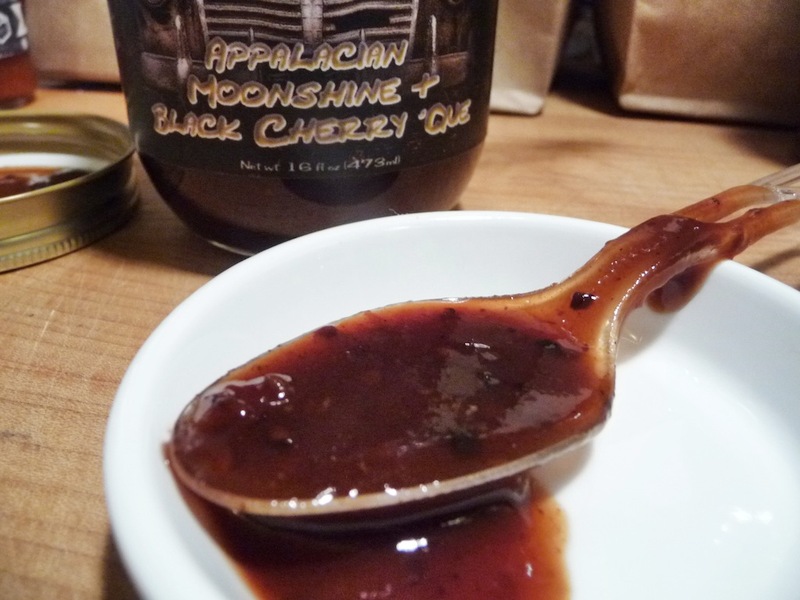 We are looking at his Appalacian Moonshine & Black Cherry Cue BBQ Sauce. Wow. The name of this BBQ sauce is indeed a mouthful, but we persevered with (had fun with) some brined and grilled chicken breast halves, brushing the sauce on the chicken as it cooked on the grill. 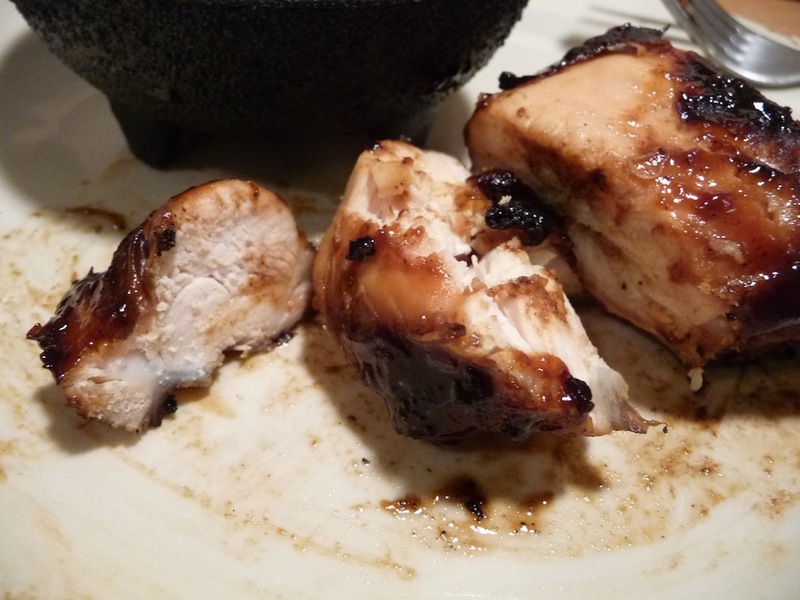 After a simple brining process (inspired by our friend and BBQ Guru Chris Grove on NibbleMeThis.com) for the chicken breast halves, we grilled them over some hot coals in the Weber Kettle grill, and started brushing on the Appalacian Moonshine BBQ sauce near the end of cooking. 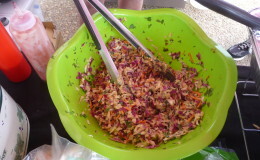 The sauce has a great “cling” factor, and stayed put as we brushed it onto the chicken. During the last 10 or 15 minutes of grilling the chicken, we painted on 3 or 4 layers of the sauce – building up a nice, thick, dark sweet BBQ coating. The taste of the sauce on the chicken holds true to the initial straight-up taste test. 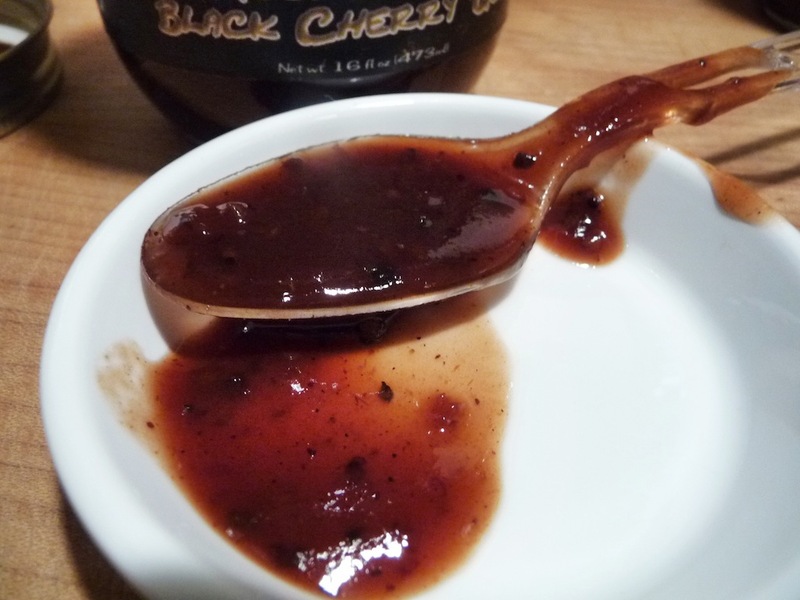 The sweet black cherry comes through with a nice supporting back end of a traditional tomato based BBQ sauce. Slightly sweet and savory and very unique. And consider for a moment, Chad came up with “smoked tomato paste”! Who thinks of this? Texture & Appearance: Very dark mahogany color and medium thick in consistency, there is a lot going on, visually, in this sauce. Bits of onion, garlic and other spices are abundant. 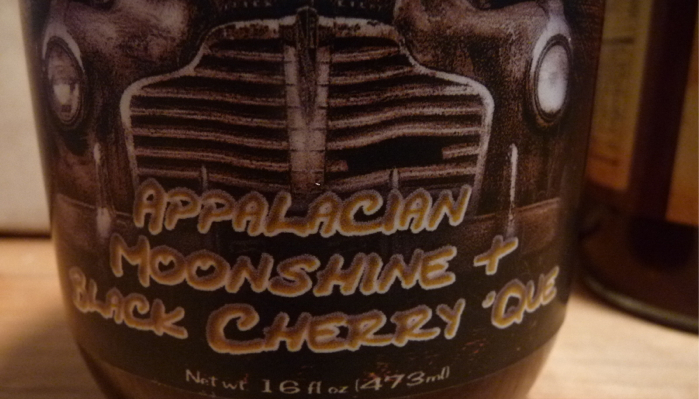 Taste Straight Up: Appalacian Moonshine Black Cherry Que is very sweet at first, with a pungent aroma of smoke and vinegar. A big zesty flavor of spices and onion and garlic are tempered by the exotic and sour tasting tamarind along with the tangy black cherries. Rounding out the flavors are the classic brown sugar and honey combo. Deliciously flavorful, with some zing from the bing! (Oops… wrong cherry). Label/Graphics: I do have an issue with the dark label and airbrush artwork of the abandoned car/truck that one might find near a still in the backwoods or hills of North Carolina. I get the reference to moonshiners, but I think it could have a brighter overall look. Something with more “pop” in appearance. Perhaps an archival photo of an actual moonshine still with a few proud Agents standing near their conquest? By the way, a quick Google search turned up news items of over 50 stills being destroyed just in early 2013 alone. 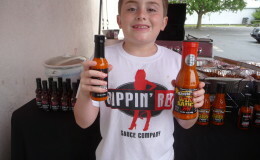 It’s a good thing Race City is only making hot sauces and condiments! Heat Level: N/A. Only slightly spicy. Very mild. Final Thoughts: Slathered onto the chicken as it cooked on the grill, this sauce set up nicely and yielded a great coating. The sugar caramelized nicely and made for not only good looking chicken, but great tasting chicken too. The sweet slightly tangy cherries really made a difference. As good as it was on the grilled chicken, I can imagine this on some bacon wrapped meatballs (MOINK balls) too. Yes, that’s on my to-do list now. 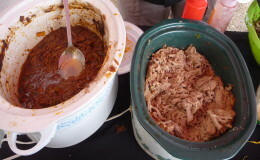 Ingredients: water, smoked tomato paste, sugar, molasses, distilled vinegar, black cherries, brown sugar, honey, natural mesquite smoke flavor, spices, caramelized onion, garlic, tamarind, natural flavor, corn liquor, salt. 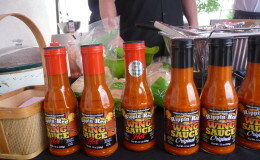 Heat: N/A – Slightly spicy from some cracked black pepper that we believe to be in the spices. There’s a nice peppery edge to the sauce. Flavor: – Sweet, tangy, thick, and full of flavor. 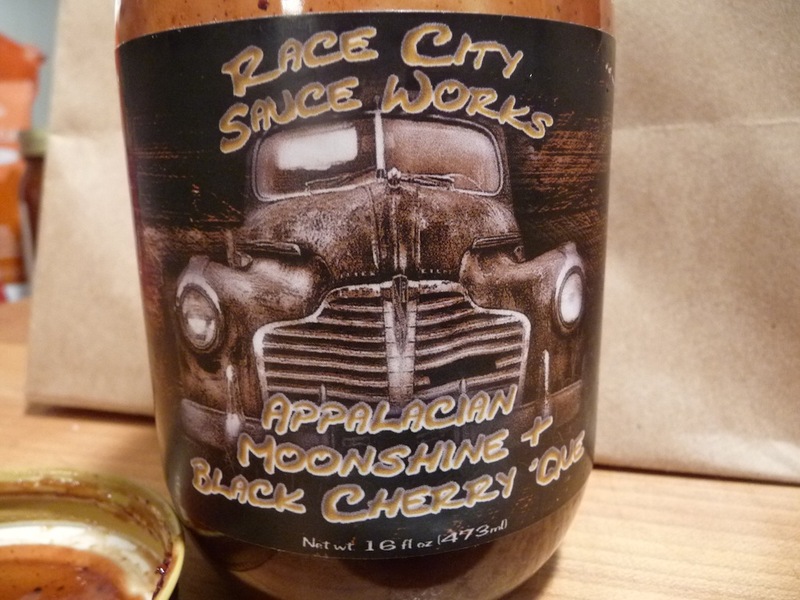 Overall: – For overall quality of flavor, ingredients, and finish, Race City Sauce Works Appalacian Moonshine and Black Cherry ‘Cue BBQ Sauce ranks very high with us for taste and unique flavor profile. 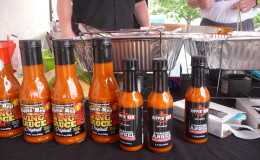 Race City Sauce Works has the worlds most creative and out of the box thinking when it comes to pepper sauces and mustards with just the right amount of heat to serve every taste. 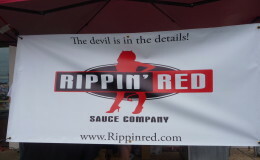 Their sauces and condiments are known the world over as being truly one of a kind. 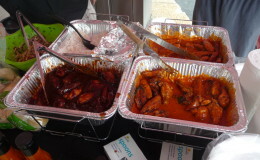 Social Media: Follow Race City Sauce Works on Twitter and on Facebook. We had a blast hanging out with Eddie Ojeda of Twisted Sister fame, while he was demo-ing his new Ojeda’s Cherry Habanero hot sauce. 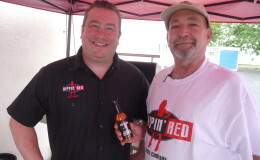 Filmed at Peppers.com‘s new store, Eddie is joined by John Rizzotti of Rippin’ Red hot sauces, where John cooked up 3 different batches of wings, some pulled pork with Eddie’s new sauce, and a ropa vieja dish featuring his new Forbidden Angel hot sauce. Some pics of the day. Click on any for a larger view. Giovanni Rizzotti – junior exec.